Why is Tokyo Tower 333 meters tall? When the steel tower was to be constructed, the authorities on radio wave science were brought together and after careful consideration of each one, if radio waves were to be sent out for the Tokyo area's more than 7 VHF television stations and the UHF television stations planned to be opened in the future, with a service area of the entire Kanto district and focused around Tokyo (Mita in the north, Choshi in the east, Numazu in the south and Kofu in the west) , it was determined that the necessary height was 333 meters tall. Thus, the fact that the 333 meter tall tower was opened for business in the Showa year 33 is just a coincidence. On the other hand, Tokyo Tower's founder Hisakichi Maeda appears to have thought, "If we're going to make it, let's make it surpass the height of the Eiffel Tower. We can accomplish it with the more advanced technology currently available." The lighting is always beautiful, but about how many light bulbs are there? The lighting which has been turning on since January 1, 1989 is called "Landmark Light,"and is made up of a total of 180 lights. There are two types of lighting: orange lights (high-pressure sodium lamps) in the spring, fall and winter, and silver lights (metal halide lamps) in the summer. In addition to being changed by professional labor twice every year, work is done when individual lights go out as well. Also, the "Diamond Veil" began being lit up from December 23, 2008, and is formed by 276 lights set in the steel tower. *From February 9th, 2019 (Sat. ), Tokyo Tower will commence with long term maintenance work on one of illuminations, the "Diamond Veil". however, the bright orange illuminations of the "Landmark Light" will light up as normal. How much is the electricity cost for lighting up the tower? Approximately 21,000 yen a day on average. What time do Tokyo Tower's lights switch off? Generally the lights switch off at 12 am. until dawn, depending on the circumstances. There is a legend that if you see the moment the lights turn off with your lover you will become happy together, and many couples gather below around midnight to gaze up at Tokyo Tower. ※Due to night time work or other conditions, there are cases in which the lights may come back on at irregular times after 12:30 am. Why is Tokyo Tower painted red and white? The two-tone color is thought to be red and white, but actually, to be precise, the two colors are "international orange" and "white." It is decided by aviation law that buildings over a certain height must use these colors. The present Tokyo Tower's area even higher than the Main Observatory is separated into 7 equal parts, but this was 11 equal parts from when it was first built until 1986. Of course paint fades as time goes by, so how do you repaint the tower, and how often? With a cycle of about once every 5 years, the outside paint is retouched over 1 year. Working hours are limited from sunrise until 9 o'clock, when business hours start. Excluding the antenna at the highest point, scaffolding is placed in order from the top of up to 270m of the steel tower, first lower work called scraping removal is done, and then the three stages of work of first coating, second coating and final coating are carried out. All of the painting is done by hand using brushes. How much paint was used to paint the steel tower? The amount of paint used for the entire 94,000㎡ painting surface is 34,0000 liters, calling on the work of about 4,200 people in all. Incidentally, if you put the paint used into oil cans (18 liter cans) and stacked them up vertically, they would reach a height 2 times taller than Tokyo Tower. Why are the Main Deck(150m) and the Top Deck(250m) separate? When the tower was first built, the part that is currently Top Deck was used as a work platform for antenna maintenance, but in July of 1967 it was opened to the public as an observatory. You can look down on Tokyo from a view 100 meters higher than Main Deck. Can you take the stairs to the Observatories? Tokyo Tower has an outside stairway that continues from the FootTown roof to the Main Deck with a height of 150m. It is open only from 11 am - 4 pm on Saturdays, Sundays and holidays, but is closed for rainy or severe weather. You can also use a descending stairway in the same way. The stairways have approximately 600 steps. You may be surprised when you hear the number, but even kidnergarteners reach the top in about 15 minutes. Does the tower shake a lot during earthquakes? The tower is designed with a flexible structure to match the earthquake-prone environment of Japan, so it is built to gently sway over time and gradually absorb the shock. This comes from a difference in the foundation work, and in one leg of the tower-footing foundation 10 individual shinso pillars (reinforced concrete pillars with a diameter of 2 meters) reach deep underground to Tokyo Bay sea level (20m). Even only a single leg can withstand 4,000 tons of strong pressure, and furthermore, each leg is connected underground diagonally with 20 steel rods of a diameter of 5 cm. The steel tower can withstand a wind speed of about 90m, and is designed to endure even earthquakes larger than the Great Kanto earthquake of 1923. Up to now, when did the tower shake the most from a tyhpoon? How much did it shake? The most was when it swayed a maximum distance of about 90 cm during Typhoon Vera in 1959 (with a maximum instantaneous wind speed of 52m). How many people visit Tokyo Tower? The highest past records of numbers of visitors to the tower are about 5,200,000 in one year (1959), about 710,000 in one month (August, 1959) and about 40,000 in one day (March 30, 1960). As for the total up to now, the number reached 170 million people in June, 2013. In other words, all Japanese people can be calculated as having gone up to an Observatory at least over the first floor. What is the equipment for the lighting like, and what are the facilities that supply electricity to the Observatories like? Because of the public nature of Tokyo Tower as an institution, we cannot make public that kind of information related to the equipment in use. We apologize for the inconvenience. There are many tall buildings, but do they have some kind of contact or get-togethers with each other? 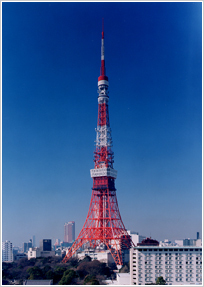 Tokyo Tower is affiliated with the "All-Japan Tower Association" (20 towers total as of 2015) and the "World Federation of Great Towers" (50 towers total as of 2015), united in a network with the famous towers of Japan and the world. Periodically meetings are also opened, information is shared and joint events are held. Tokyo Tower has mascot characters? The Tokyo Tower mascots, "Noppon Brothers" usually appear on weekends and national holidays! They will interact with visitors and take photographers together with them...Please play with them when you see them!